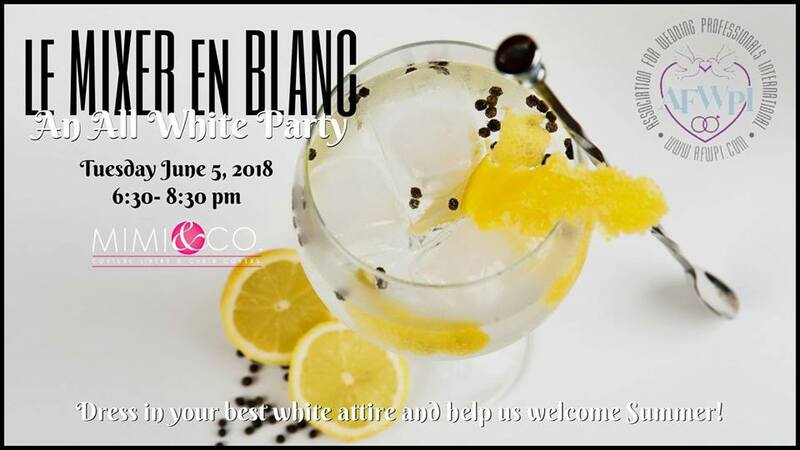 We are hosting our very own Mixer en Blanc, to play off of the great Diner en Blanc hosted yearly! Wear your best white attire and help us kick off summer! Be among the first wedding professionals to experience this brand new venue in the up-and-coming Del Paso Boulevard district. Owned by the well-known linen couture company, Mimi & Company, the space is designed to accommodate almost any type of event. Spacious, with white walls, a welcoming entrance and an art deco flare. For more information about AFWPI and its benefits, click here or call us at 916-329-5000. Pay in advance – avoid standing in line at registration. IF YOU ARE A FIRST TIME VISITOR PLEASE USE THE “REGISTER NOW” BUTTON ABOVE. THIS PAYPAL LINK WILL NOT WORK UNLESS PAYING FOR THE MIXER!